I would describe my video editing expertise level as "jack of all applications, master of none." I have the most experience with Adobe Premiere. I've used it a bit for work videos, most often in collaboration with others who did the hard stuff. I even took an introductory Premiere class a couple of years back. I took extensive notes that I refer to from time to time, but very little of what I learned in the class became muscle memory for me thanks to infrequent use. I've also used Final Cut Pro X and its predecessors for basic edits over the years. And more recently, I've played around with iMovie on the iPad for some quick videos for family and social media. As I set out to make more videos, it's important for me to settle on a video editing application that I can master over time. If the process of editing videos becomes faster and more natural, I'll do it more. But setting on an application to use has been trickier than expected. Going in, Adobe Premiere seemed like a rather obvious choice. It's widely used by both professionals and serious amateurs. I have some baseline experience with it. It will help me the most in my day job and make it easy to collaborate with others. And as part of the Adobe Creative Cloud suite, it also serves as a great "gateway drug" to other powerful applications like Adobe After Effects. There's only one problem: I don't enjoy using Adobe Premiere. I have this problem with other Adobe applications as well. They are very powerful, and they are often the de facto standard for certain types of creative work. But they are also often clunky and slow to use. It's nothing I can't muddle my way through, particularly if I'm getting paid to do it. But life is too short to spend personal leisure time fighting with software that isn't fun to use. Nonetheless, I tried to power through these reservations late last year. I started an Adobe Premiere Skillshare class over the holidays that, in addition to giving me a general refresher, provided some good pointers on how to organize the Premiere user interface in ways that were more intuitive for me. OK, I thought, I can bend this thing to my will and make it fun. But it fought back. From a performance standpoint, Adobe Premiere was painful to use on a MacBook Air that, while a few years old, performs perfectly well with everything thing else I throw at it. It went from clunky to unusable when I started experimenting with 4K footage. I'm sure there were some settings I could have tweaked to generate proxy media that my system wouldn't choke on, but I had this sense that there would always be something. I ended up aborting my Adobe Premiere Skillshare class before completion and switching to a Final Cut Pro class. While Adobe Premiere seems to be the choice of many serious video creators, Apple's Final Cut Pro X is still very much in the mix. Apple alienated some of its longtime Final Cut Pro users by making some polarizing changes to the application during a major re-write that released in 2011, but in the process I think they made it more approachable for people who are new to video editing but crave professional features. I find the user interface much more pleasant, and it performed extremely well on my MacBook Air. This was even the case with the same 4K footage that crippled Premiere on my machine, since Final Cut Pro optimized the footage automatically. Final Cut Pro also seems very adept at performing computationally intensive tasks in the background while ensuring that user experience takes performance precedence. I made it through to the conclusion of the Skillshare class and put my learnings to use on a fairly intensive family holiday video. Final Cut Pro was fun to use in way that Adobe Premiere never was. I still had to research and learn things along the way, but it was learning to unlock new creative skills versus tinkering to get the application to look and perform in an acceptable manner. There is a lot of angst these days about how committed Apple is to the professional market (and the Mac in general). I'm not as worried as some, but I still had some reservations about investing a bunch of time and effort into an application with a somewhat less certain future than the Adobe suite. But Final Cut Pro really won me over with its usability and performance. I'm a heavy user of the 12.9-inch iPad Pro. The jury is still out on whether iOS represents the future of mainstream computing, but it really feels like the future for creative applications. I find editing photos and videos on the iPad more enjoyable than any other platform. The immersive, tactile nature of iOS on the iPad just feels right. The big issue is that iOS software applications are just scratching the surface of what is possible and needed on the iPad. RAW photo editing is just now coming into its own on iOS and remains very immature. And there isn't a true professional video editing application for the iPad yet. That said, Apple has done an amazing job with iMovie on iOS. You are immersed in your content instead of the inscrutable collections of buttons, sliders, and windows you see in traditional video editing applications. It also performs very well, even with 4K footage. As with many iPad apps, I'm able to sit back on the couch and interact with the application in a more leisurely manner. This is a big deal to me, since I feel like I already spend way too much time hunched over a computer during my work days. It's nice to have a different "having fun with technology" context that doesn't feel like work. But there are some major drawbacks to iMovie on iOS when compared to an application like Final Cut Pro on the Mac. iMovie works for basic edits, but Final Cut Pro is orders of magnitude more powerful, flexible, and customizable. There is also a rich ecosystem of third party plug-ins and companion applications, along with Apple's own powerful Motion application for motion graphics. I probably don't need the full power of Final Cut Pro today, but there are many features that interest me greatly, such as the ability to stabilize and color correct footage in post-production. Neither of these things are possible with iMovie on iOS. I'm also very interested in experimenting with different frame rates and with speeding up and slowing down footage. You can do these things with great precision in Final Cut Pro, while iMovie gives you a basic "tortoise and hare" speed slider that is very limited. 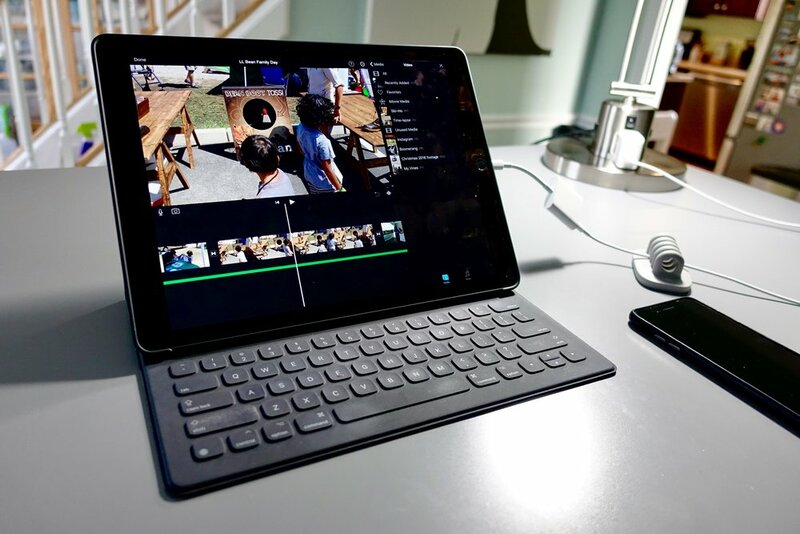 Media management is also a challenge with iMovie on the iPad. I need to jump through hoops to import video footage from my Sony RX100 V into the native iOS Photos app. The size and volume of video files also makes them easier to deal with using a traditional file system that isn't automatically synchronized to the cloud. Choosing Final Cut Pro X over Adobe Premiere is decision that I feel very good about. I'm still far from an expert on Final Cut Pro, but I've developed some initial keyboard shortcut chops and can perform basic edits relatively quickly. There is part of me that wants to run faster down this path by taking more classes and continuing to develop my Final Cut Pro skills. But my love for the iPad Pro and delight in using iMovie on iOS pulls me in that direction as well. Limited as it is, it's fun to use. And I'm sure that iMovie, as well as other iOS editing apps, will grow more powerful over time. Who knows, we may even see Final Cut Pro on the iPad someday. So perhaps seeing how creative I can get within the constraints of iOS is a better place to focus. Will it push me to develop my skills in other areas faster? After all, producing better footage out of the camera will reduce my need for things like stabilization and color correction. Or will the constraints of iOS frustrate me and prevent me from producing videos at the quality level that I aspire to. It's hard to say. As my next step, I'm going to revisit iMovie on iOS and see if I can make something I'm happy with while keeping things simple. I have a feeling that it will send me running back to Final Cut Pro, but the iPad lover in me hopes I'm wrong.